Linea Alba (meaning "White Line" in Latin) is a three pitch bolted route heading straight up the dead vertical (and sometimes overhanging) White Wall in the Main Fork Rock Creek drainage of the Beartooth Mountains. The route itself sits merely 300 yards south of the Montana/Wyoming border. The climb actually has a distinct alpine feel to it despite being a sport route making the climb a unique experience. 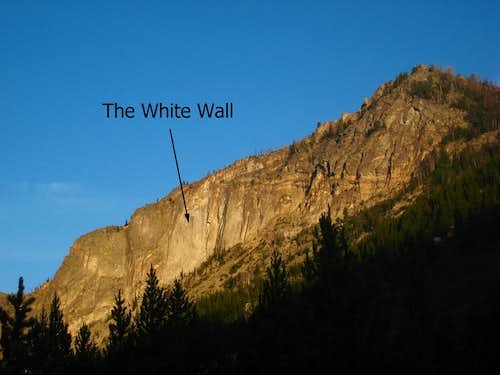 The rock on the White Wall is Andesite which is typically horrible rock to climb on (think Mount Rainier) but strangely, the rock here is superb and the climb is characterized by sustained 5.9 climbing with small crimper holds, and a crux overhang on each pitch. The overhang on the third pitch is the crux of the route at 5.10d and requires a big move to surmount! The route was put up by Bill Davey in 2005. He found a real gem here and this climb is recommended to anyone who wants a more adventurous day of sport climbing. The closest town is Red Lodge which is the base for most trips into the Beartooth Mountains. Head south and west out of town on the main Highway 212 towards the Beartooth Pass. 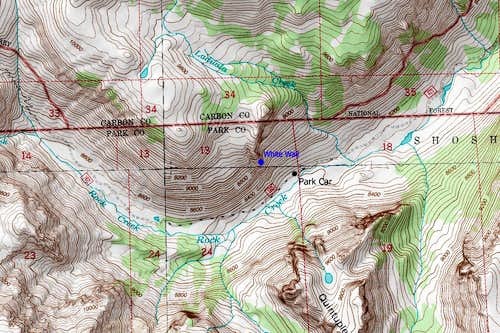 Go 11.4 miles and turn right onto FS 2421 (Rock Creek Road) and measure from this point. Follow this paved road for 0.9 miles where it turns to dirt and passing by three National Forest campgrounds. Here the road forks, take the left fork and continue on the good dirt and pass the M-K Campground at mile 2.8. Here the road becomes rougher and isn't passable to low clearance passenger cars. Continue up the road which is very rocky and typically filled with large potholes for an additional 6.2 miles from the M-K Campground and park off the left side of the road where a break in the trees on the right side is found. Elevation here is 8,240 feet. Do not go all the way to the trailhead at the end of the road which is 8 miles from the M-K Campground. As you drive the road, the White Wall is obvious to see above the road to the right dropping off a steep buttress which descends southward from the Hellroaring Plateau. The wall itself that holds the route is on the east face of this buttress and rises about 400 feet from the talus slope at its base. See the photos below. From the parking spot, begin hiking up the talus just right of the road and work your way through sparse trees up the very loose talus. Make a steep ascending traverse in a northwest direction aiming right for the base of the White Wall, which is distinctly brighter than the rest of the cliff face and can't be missed. Reach the base of the route at about 8,740 feet which is 500 feet above the car. Locate the first bolt in the middle of the White Wall about 50 feet left of a very large dihedral. 2 5.10b 120 Feet 12 The second pitch continues straight up the face and trending rightward. anchor is just a few feet above the overhang. needed. Once above this crux, it's another 20 feet or so to the final anchor. Descending the route may be confusing at first but it's really quite simple once you know where to go for the last rappel. From the top of the third pitch rappel roughly 90 feet back to the second belay anchor. For the second rappel, do not rappel to the first belay anchor at the top of Pitch 1 as this anchor leaves the final rappel too long for a 70 meter rope. 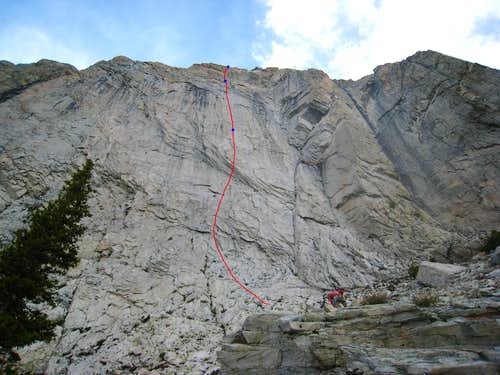 Instead rappel slightly to climbers right to another double bolt (but no chain) anchor close to the large dihedral that is seen from the base of the route. Numerous slings with biners are found through these bolts but they may need to be replaced. The final rappel drops a full 35 meters along the dihedral to the talus below where you can then scramble 30 feet down to the start of the route. For some added fun, don't pull the rope right away after the final rappel but try and toprope the full 35 meter pitch. It goes at 5.10a but the rock is of lower quality than Linea Alba. It's amazing how just 30 feet to the right the same rock is lower quality. Although this "toprope" pitch can be climbed with trad gear, it isn't recommended due to the loose nature of the rock. When done climbing, hike down the horrid loose talus to your car. At least 15 quick draws, 70 meter rope, helmets, harness and belay devices, anchor slings, and extra webbing in case the final rappel anchor needs updating. A jacket may also be nice as the wind can really howl up and down the valley. Wood and Iron Works beta (Roscoe residents) for Linea Alba and "Toprope"